Then I caught up with my mentor and outfitter Montana's Master Angler – Tom Travis before the guiding season started. I spoke to him about my newfound interest. 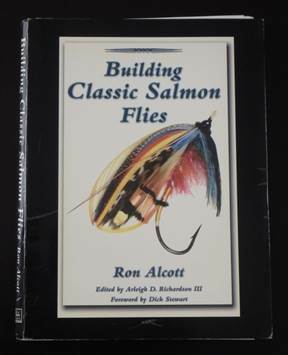 He advised me it would be a good move of mine as learning Atlantic Salmon Flies would improve my entire fly tying skills and interpretation. Then he let me borrow this book. This book (Frank Amato Publications, Inc. ISBN: 1-57188-339-8) is very reading for every newbies in this subject. Alcott reviews pretty much every category: history, materials, tools, and modern interpretations. Then he steps into step-by-step "building" instructions. As I learn more from other books and dress more flies, my preferred methods and styles differentiated from this book. Yet this is still a practical and concise book for certain. Though I wish the book could have used more photos of completed flies, Chapter 2, 3, & 4 are great references for materials and interpretations. Satoshi Yamamoto, www.leftyanglerandflies.com, is a guide and a fly-dresser in Livingston, MT.